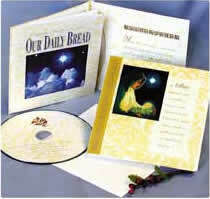 This new card features 5 rich instrumentals of favorite holiday music on one CD, and 5 Christmas-theme devotions from the pages of Our Daily Bread. The greeting reads, “A star, radiant and compelling, announced Christ’s birth. Heaven’s song came down to earth and set our hearts to singing. May the message and music of God’s priceless Gift wrap your season in joy and love.” There’s even room to jot down your own thoughts, sign it, put it in the envelope that comes with the card, and you can mail your gift to your loved one and share so much more this holiday season. It Was a Starry Night.